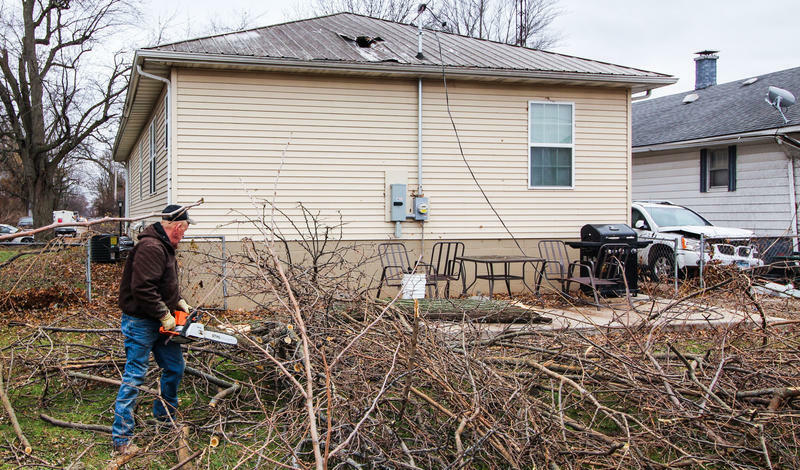 Valerie Coffey cleans up debris next to her house in Taylorville, Illinois. 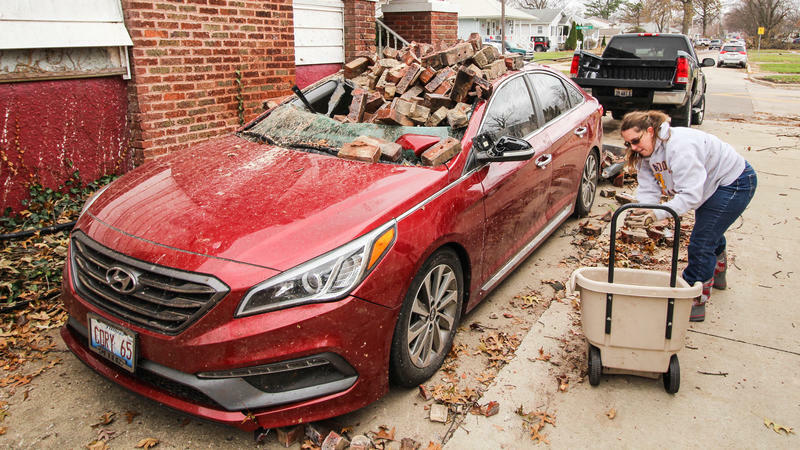 The December 1, 2018, tornado toppled her chimney onto her fiancé's car. 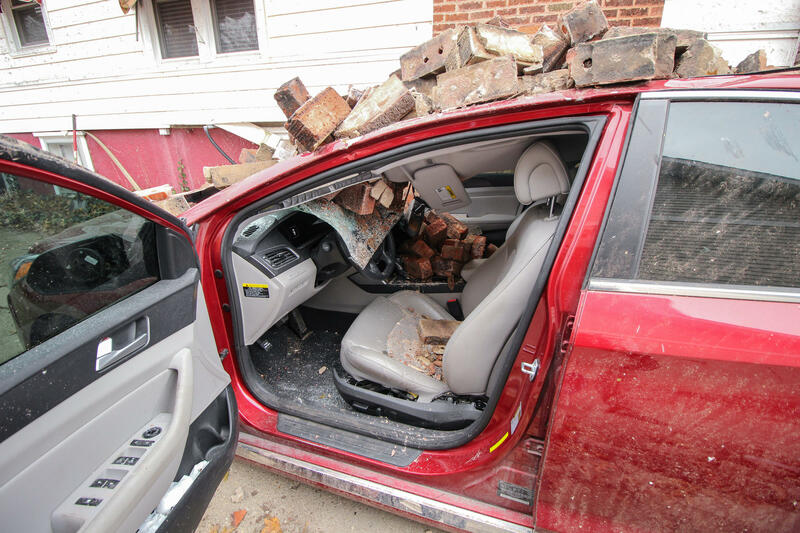 A brick chimney smashed through the roof a car during Saturday's tornado in Taylorville, Illinois. The Taylorville tornado toppled signs, knocked over power poles, and sent a tree limb through the roof of this house. 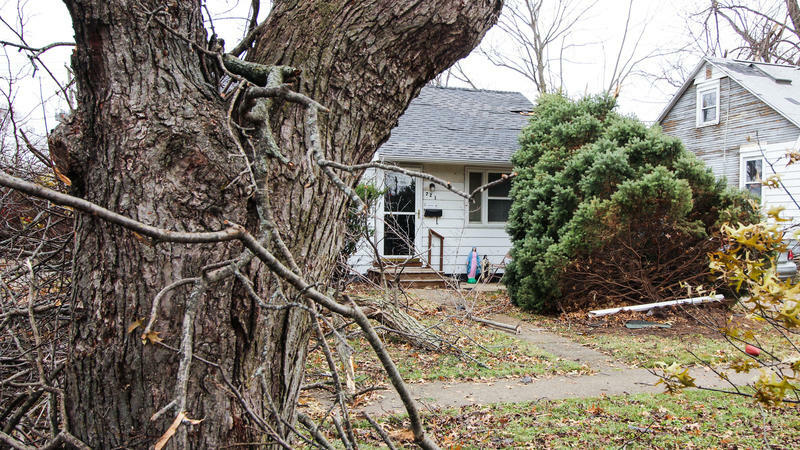 A tornado felled numerous trees in Hewittville, Illinois, on Saturday, December 1, 2018. An Ameren employee works to repair power transmission lines in Taylorville on Sunday, December 2, 2018. 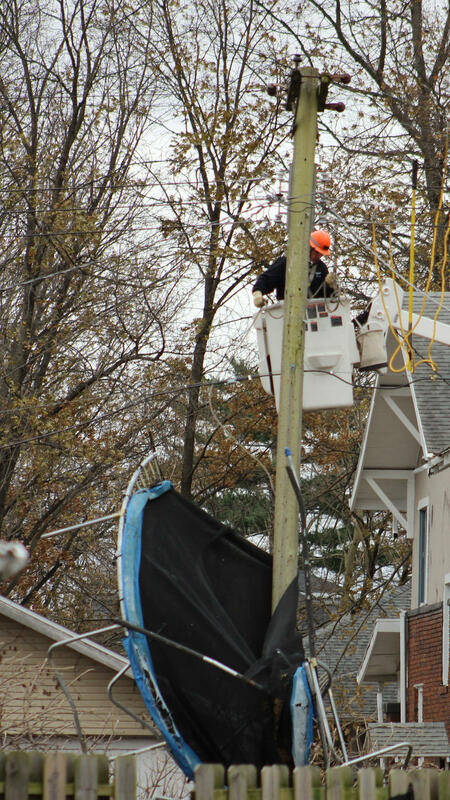 Saturday's tornado felled trees, damaged roofs, and wrapped a trampoline around this utility pole. 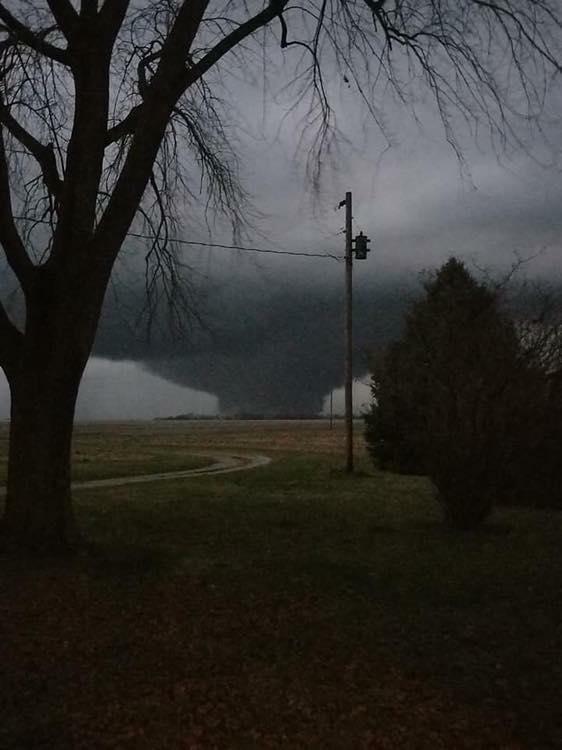 Saturday's tornado knocked down numerous trees in Taylorville, Illinois. 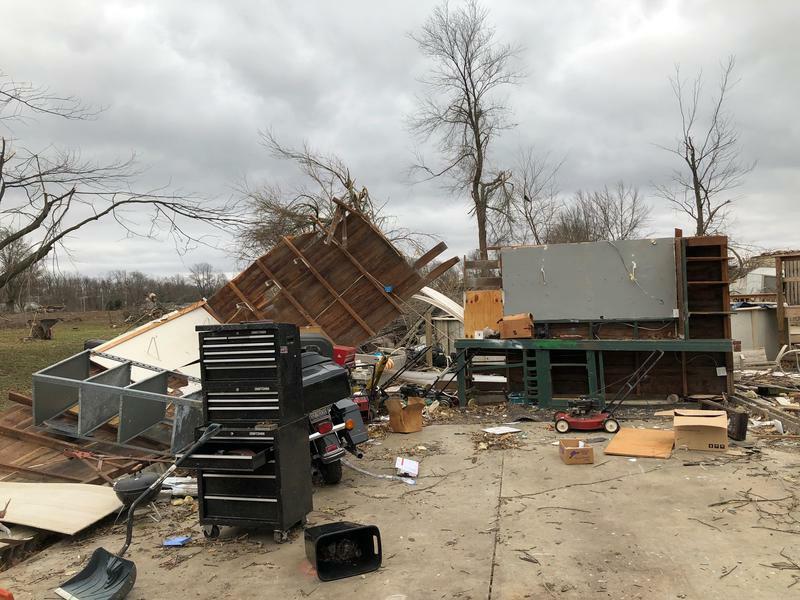 A tornado damaged a residence in Hewittville, Illinois, on Saturday, December 1, 2018. A tornado dropped a massive tree limb onto a garage and backyard swingset on Saturday, December 1, 2018, in Taylorville, Illinois. 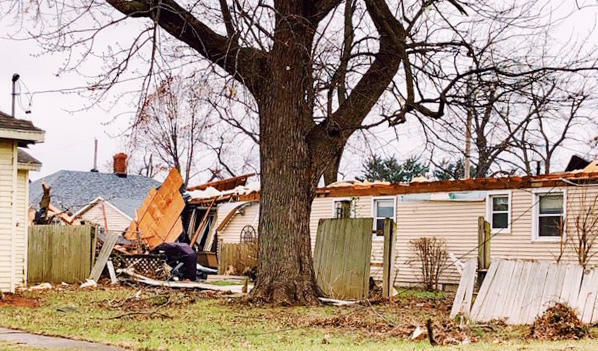 Saturday's tornado damaged a house in Hewittville, Illinois. Taylorville High School athletic teams are known as the Tornadoes. Sunday brought daylight and a chance to view the magnitude of damage in Taylorville. Many residents spent the day removing debris and helping neighbors after a tornado roared through the Christian County community on Saturday afternoon. Taylorville Memorial Hospital announced it had treated 21 people following the storm. 3 had to be transferred to Springfield for additional medical care. Earlier, rescue crews worked to free individuals trapped in buildings. Taylorville officials say they believe all are accounted for. Resident Norma Cross was home alone when the tornado arrived. “I was looking out the door and about the time it hit, I ran for the closet. But there was too much stuff in the closet so I couldn’t get in so I stayed in the hallway. I’ve been in a tornado before and that’s what it was. The noise was tremendous,” she said. Cross spent much of Sunday going back and forth between her house and her car. Without power, she had no heat inside the home and was using the car's heater to warm herself. 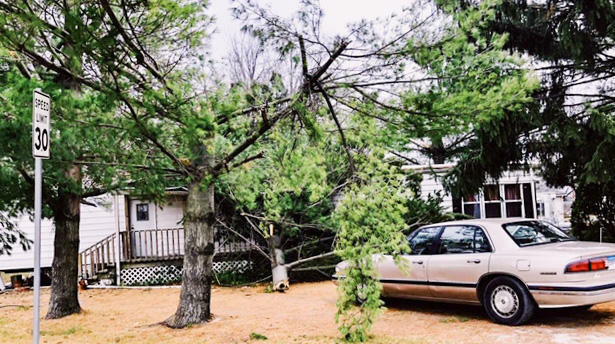 Shane and Sarah Perini were busy Sunday picking up limbs from their backyard and covering a hole in their roof. "We had friends over in the basement. We watched everything out the window," Shane Perini said. "It was pretty bad. Our ears were popping. It was intense." "It got very dark and we heard the hail. I could see the trees outside from the window standing sideways. I thought they were coming down. The house kind of shook, which I am guessing was from the tree hitting the roof. Very lucky. All the kids are safe. We’re safe," he said. Just down the street, Cory Vickers and fiancee Valerie Coffey were removing bricks that fell from a chimney on top of their car. Vickers was home in the basement with his pets. 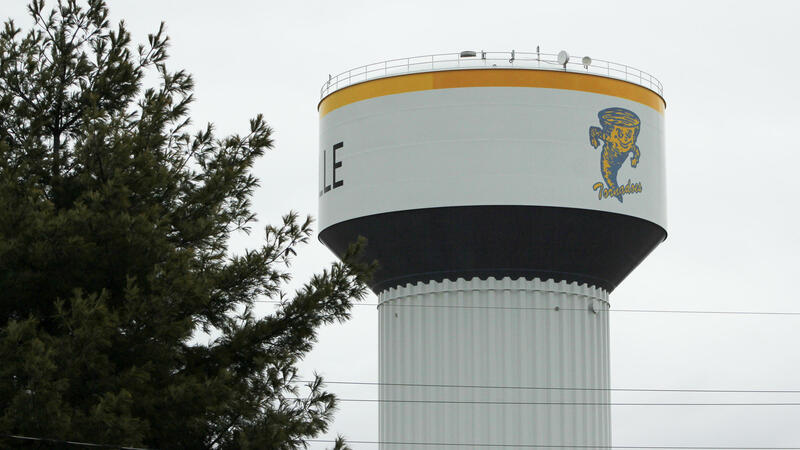 Taylorville had planned it's lighted Christmas Parade, an annual event, for the evening. But that was canceled when the threat of severe weather became more apparent. 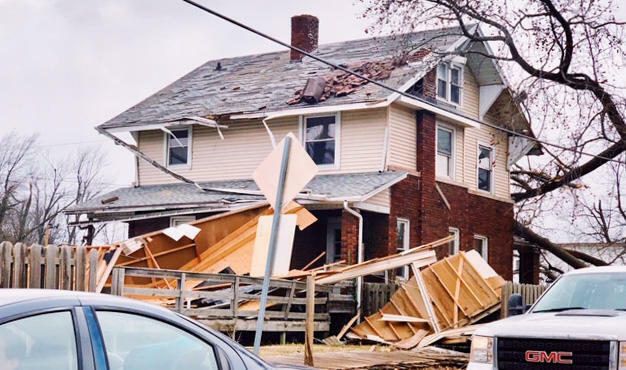 As the storm bore down on the city, the National Weather Service issued a rare Tornado Emergency alert and warned that "catatrophic" damage could result. The storm struck the city of more than 11,000 around 5:15 p.m.
Ameren crews were at work Sunday in an effort to get power restored to all residents. A shelter for those who could not return home is in place at the Crossroads Apostolic Church on Jaycee Drive. The Taylorville Food Pantry opened Sunday for those needing emergency help. 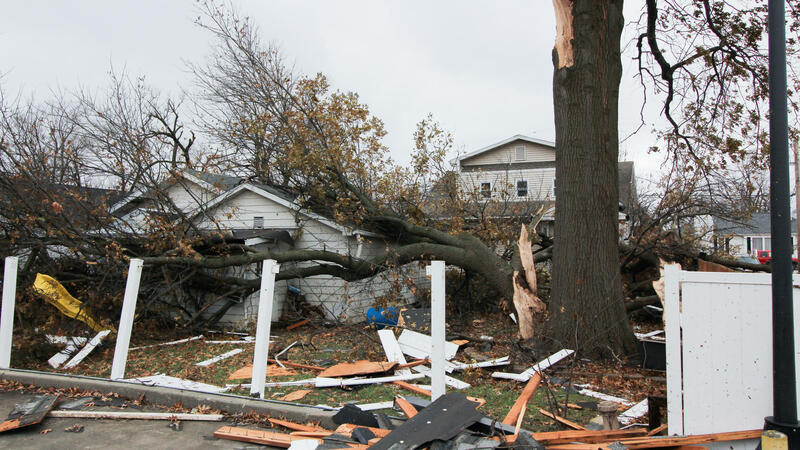 Taylorville appeared to be the hardest hit community on a stormy day in central Illinois. The National Weather Service said this particular supercell took a long path from the eastern fringes of the St. Louis metro area, to east of Bloomington. Other supercells tracked up the Illinois River valley in west central Illinois. Damage assessments were planned for Sunday. Taylorville residents have been instructed to be aware of contractors going door to door. The city is putting a system in place where those licensed and registered will be listed. Officials are still advising motorists to avoid the hardest hit areas so that cleanup can continue. Governor Bruce Rauner, Congressman Rodney Davis and local leaders held a news conference to praise the resiliency of the town. Davis pointed out a large number of individuals, both from Taylorville and from out of town, chipped in to help others. He says that’s what small town America is all about. He urged people to come to the city to patronize businesses. But he also urged those who want to drive around to see damage to look online, rather than get in the way of cleanup crews. Taylorville Schools and Lincoln Land College's Taylorville campus will be closed on Monday, Dec. 3. The Red Cross is accepting donations to help those in Taylorville. A 9 p.m. curfew was issued for the next several days.